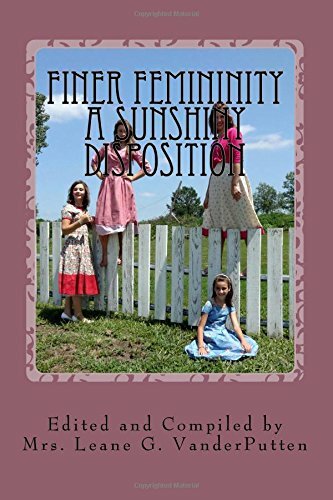 New Spring Maglet – A Sunshiny Disposition – Now Available!!! I am excited! I’m glad I started early on this Maglet because it took some dedication and perseverance….Seems I just couldn’t get things right. I will say it was glitches instead of dumb mistakes (a bit of both, really). 🙂 But anyway…..HERE IT IS!!! I wish to send out a sincere THANK YOU to Maryarc who wrote the article: Fiber, Fabric and Style! Also, from our own community, Theresa Walker, Father Kenneth Walker’s (R.I.P.) 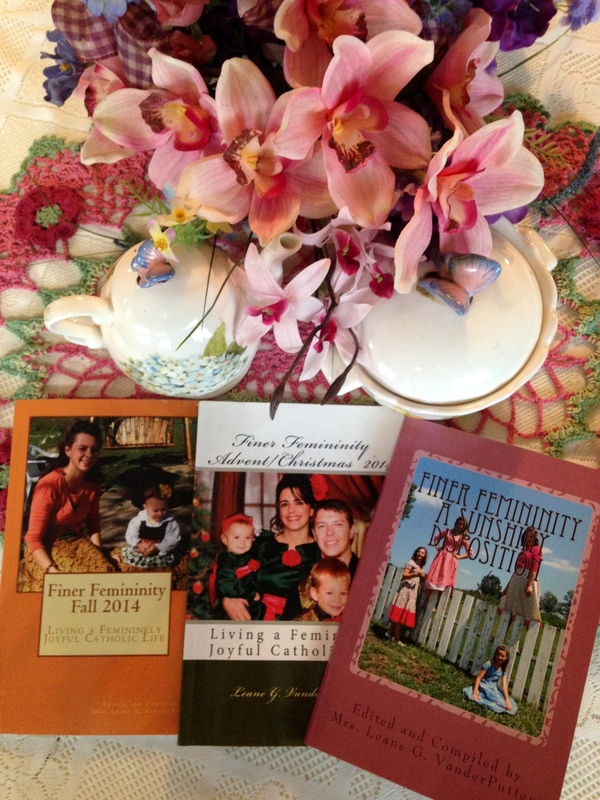 sister-in-law, who wrote: A Mother’s Cross and A Short, Tall Tale for Mothers! It is exciting for me to share with you the talents and the thoughts of others who have something worthwhile to say to the Catholic world!! Here is the run-down of the Table of Contents so you can see how much wonderful information is packed into this little Maglet that I called A SUNSHINY DISPOSITION! Does Your Marriage Need Warming Up? The Maglet has quotes and pictures sprinkled throughout making it a pleasure to peruse! I hope you like it!! 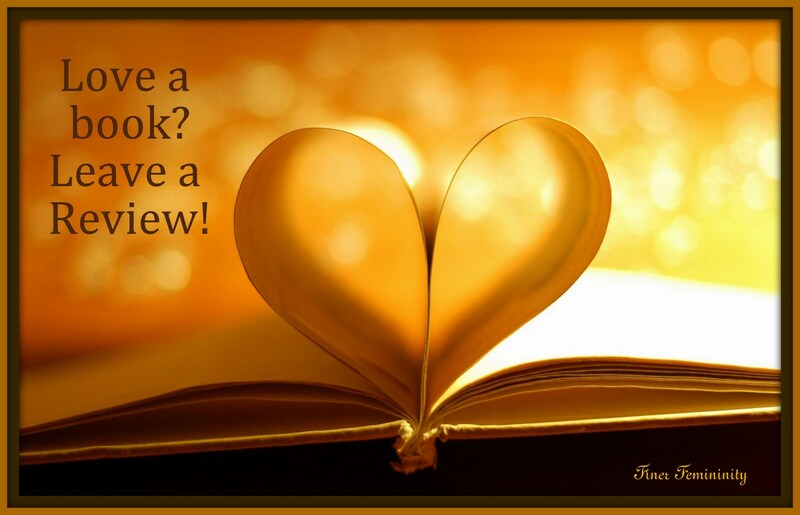 If you do like them, please leave a review on my Meadows of Grace Shop! You can leave a review on Amazon, too! It is available through Meadows of Grace. You can also get all three volumes of the Maglets0 here. 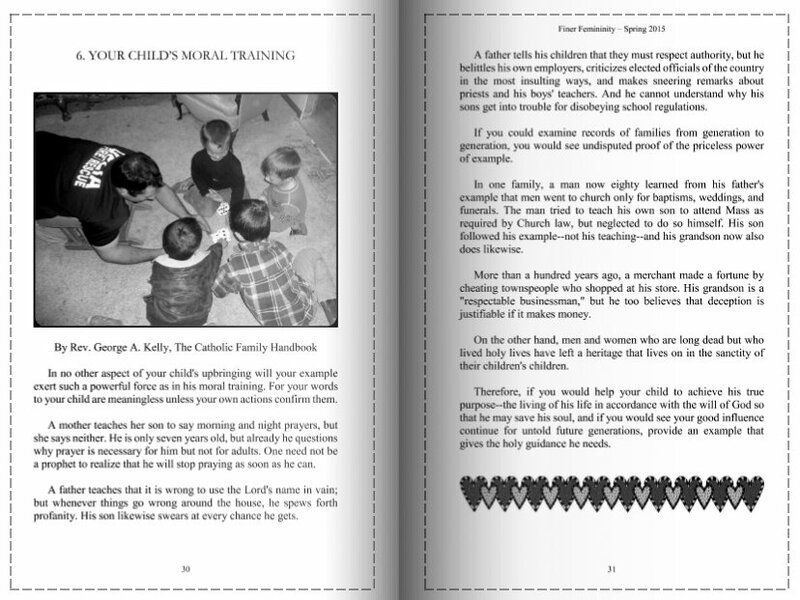 Finer Femininity is a small publication compiled to inspire Catholic women in their vocations. It consists of uplifting articles from authors with traditional values and many of them from priests, written over 50 years ago. These anecdotes are timeless but, with the fast-paced “progress “of today’s world, the pearls within the articles are rarely meditated upon. This little magazine offers Catholic womankind support and inspiration as they travel that oftentimes lonely trail….the narrow road to heaven. The thoughts within the pages will enlighten us to regard the frequently monotonous path of our “daily duties” as the beautiful road to sanctity. Feminine souls need this kind of information to continue to “fight the good fight” in a world that has opposing values and seldom offers any kind of support to these courageous women. 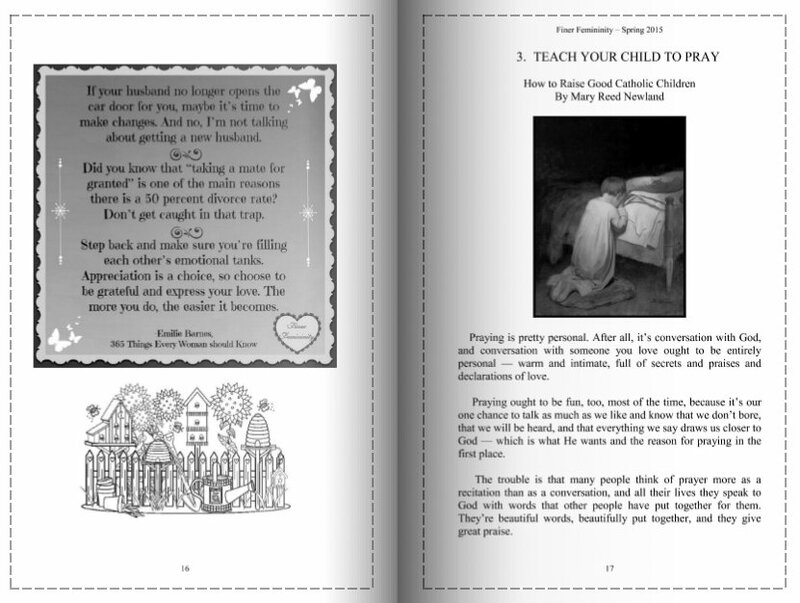 Inside the pages you will find inspiration for your roles as single women, as wives and as mothers. 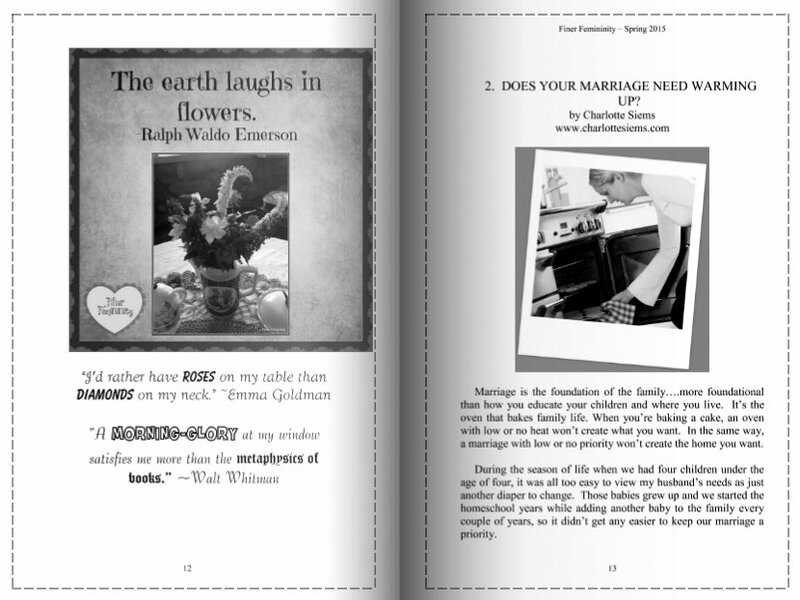 In between the thought-provoking articles, the pages are sprinkled with pictures, quotes and maybe even a recipe or two. So….if you like my book, won’t you please leave a review? Yeah!!!! Ordered, looking forward to all of it!!! Thank you so much for your contribution to the maglet Mary!